On July 1st, a beautiful summer day- two high school sweethearts tied the knot. 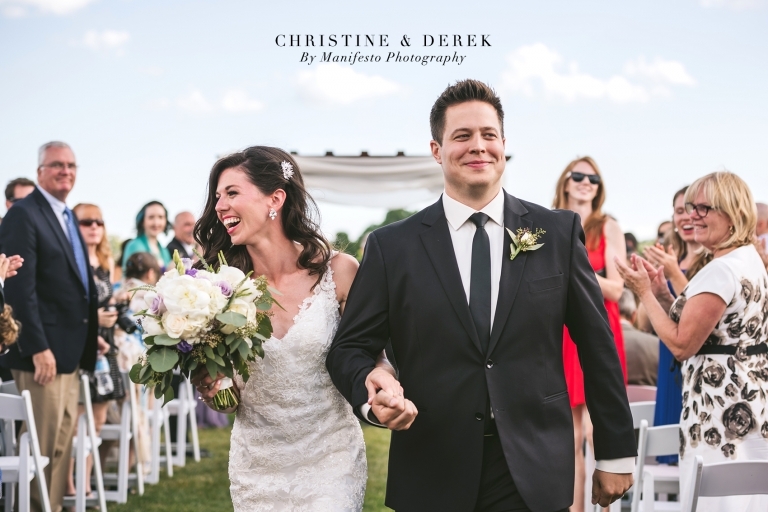 Family and friends gathered together at Mastronardi Estate Winery to witness the marriage of Christine and Derek, two dazzling people who were meant for each other long before they even knew. Both love spending time with family, being outdoors bike riding and walking their dog; these relaxed, easy-going qualities effortlessly translated into their fun, lighthearted wedding day and we were so excited to be there with them! Earlier that morning we met the couple at their family’s cottage; the bright, airy atmosphere served as the perfect backdrop for Christine and Derek’s romantic first look and gave the two the chance to spend some time alone before the events of the day. Christine looked radiant and timeless in a delicate lace sheath dress from It’s Your Day Bridal Boutique and shoes by Modcloth, her hair styled softly behind her ear. Derek was handsome and debonair in his black suit from Freeds, a skinny tie adding a touch of flare. From there we traveled to Mastronardi Estate Winery where Christine and Derek had their outdoor ceremony and reception. The day was warm, a slight breeze rustling through the vines as the two said I do surrounded by loving family and friends, bridesmaids in full length beaded gowns and groomsmen in charcoal suits. The reception was elegant and classic with champagne and ivory decor accented by bursts of lilac. The evening was filled with mix and mingling, heartfelt speeches, and amazing dance moves! Christine and Derek, it was a pleasure working with you both and an honour to take your wedding photos. We wish you nothing but the best in this new chapter of your lives together and look forward to seeing all the wonderful things in store for you both in the future!